Busy working mom of 4 boys, 2 dogs and 1 husband seeks a new set of wheels. Fuel efficiency is a must, a DVD player and lots of cup holders will be considered a plus. Must be willing to work long hours and be ready on a moment's notice to haul 5 or 6 kids to the movies, sleepovers and to sporting events. Experience with lots of snow, some ice and pot hole dodging is required. Candidate must not have allergies to dog hair, grass, dirt or mold and should be comfortable with dog poop on the bottom of shoes and the smell of 4 sweaty boys on a 96 degree day. Yep, I'm in the market for a new car/van/SUV. I know, I just said a dirty word. SUV. I have four kids, three of whom now weigh more than I do and will soon tower over me by almost a good half foot. I still have one boy in a car seat, two large dogs and a husband who needs leg room. My car needs to be super sized, not because I want to, but because I don't have a choice. Two years ago I gave up the suburban prerequisite mode of transportation, the hulking SUV. I traded it for a much greener mini-van with power doors, a DVD player and climate control. Pretty nifty features and it got better gas mileage and even fit into my garage with room to walk around it on all four sides! Until it went into the shop at 3,000 miles. Again at 10,000 and then again at 11,000 for an entire new transmission. And then it snowed and I couldn't get up my driveway or down my street. Now, my lease is up and I am looking for a new ride. New or used? Lease or buy? SUV or mini van or crossover? I need three full rows of seating, lots of cargo space and air conditioning. I would like to get decent city mileage, 95% of my driving is around town, so those inflated highway mileage numbers mean nothing to me. So far I have three candidates that have answered my want ad, but maybe you all know of a better, greener option for big families? I feel that this is a segment of the market ignored by the automakers, both domestic and foreign. Candidate #2 - The SUV. I have been stalking two used Tahoe Hybrid SUVs by Chevrolet. The size is ridiculous, the highway mileage is pretty bad and I think the wacky sticker running down the side that proclaims "HYBRID" is absurd. However, it gets 20 mpg in the city, which is key for me and it has tons of space and the price on these used models? A screaming deal. And, it will offer me better traction and safer travel in the winter. We've had 60 inches so far this winter, so my patience is wearing thin driving around town in my mini-van. But really? After all this talk about going green and I go back to a SUV? And what will I have to take out of my garage to fit the monster inside? What about hybrid driving? The batteries, the maintenance? Will it end up costing me more than a basic mini-van? So, I'm stuck. I have a little time to make my decision, but the Type-A personality in me means that I must research every option, track down every rebate and test drive every model. I plan to buy this one and keep it for years and years, so I need to make the right decision for both my family and the environment. Do you have a greener, cleaner, more spacious and reliable vehicle suggestion for a big family? Have you looked at the Honda Pilot? We are looking at a CRV since we have two kids and don't need as much space as you do, but a lot of my friends have Pilots and are very happy with them, and the reliability on Honda is pretty hard to beat. I suspect with 4 wheel drive it would be pretty good in snow and ice, but I also know that any car with snow tires is ten times better in snow and ice - it's a bit more hassle to change them spring and fall, but an extra set of tires and rims is way cheaper than a 4 wheel drive upgrade, or a "better" car for snow. And with all those boys they can get practice changing tires! I'm sure Toyota has an equivalent "big SUV" too - I just don't know what it is off the top of my head. I think that both Hondas and Toyotas get pretty good mileage compared to the American cars, and while they're not hybrids I think for the money and the safety/reliability factor they're pretty darn good, plus you can drive them into the ground. We had a Dodge Caravan that we also had tons of problems with - I would definitely not go there. A friend has a Suburban which is really big, but doesn't get great mileage, although it's been pretty reliable. I also drive mostly around town, so while mileage is important, if you're not going many mileage, it becomes less of a factor. Good luck looking and let us know what you pick - we need to replace our car but we've been putting it off - hard to want to go look at cars in the freezing snow and ice! we had bad luck with a Dodge Caravan, too. I have drooled over the Honda Pilot, as well, but we don't need the size any more. I will say we love our Honda Civics we've had and they have been totally reliable, as well as having great service and waranty, so we've pretty much decided to stick with Honda for any future car needs. The only other thing I would say is that I don't think leasing is the way to go. 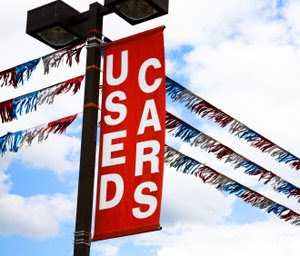 To me, finding a good used car that is less than five years old is always the best deal financially. Just my two cents. Are you fixed on getting an American car? I noticed that all three of your choices are American cars, but like JAM and Joyce said, we have found that Hondas and Toyotas are much more reliable. I drove a 14 year old Toyota Corolla when I first got married, and it was still going strong when I sold it. My husband went through three American cars in the first two years of our marriage. We now have a Honda Odyssey and have been very happy with it. In two years, we've never had any problems with it. Sorry. No suggestions here. I'm really frustrated by the lack of fuel-efficient options for people who NEED large vehicles. I don't have a bunch of kids to tow around, but I have a bunch of animals and live in hurricane territory. I need a vehicle that at a moments notice can be loaded with animals, food and litterboxes (oh, and maybe there will be room left for some clothes and stuff for me!) for an evacuation. So I currently drive an old Jeep Cherokee that gets about 13 mpg, but it is perfect for my situation right now. Luckily I live only four miles from work, and don't do much driving otherwise (I think I do about 300 miles/mo), so it isn't such a bad choice for me. Good luck! I'm assuming that being in Michigan you need to buy American, but if you think you can get away with a Honda, I second JAM's recommendation of the Honda Pilot. My uncle and aunt have one and it is fantastic. If you are into buy American, remember that a lot of foreign companies have American plants. No idea which ones. But I wanted to second the Honda suggestions. They are known for having the best fuel efficiency in their class. We love our CRV, like others have said. I love this post and the fact that you brought up that SUV is considered a dirty word. Although we don't need the room, my husband and I are struggling with the next car purchase as well. We live in the DFW Metroplex where it seems every other vehicle is a Hummer, SUV, or Ford F-350 so size and safety are concerns. Although there is some public transportation in the inner part of the Metroplex, the outlying areas are not as connected. We will definitely look into Honda and some of the others. Jam - Based on your recommendation, I did a quick search on the Pilot and by golly, those things seat 8 people! There is a used one near me for a good price, but I would have to convince my husband. His job deals directly with the Big 3 automakers, so he drives a Dodge truck, but I'm pretty sure his clients won't ever have to see my car! I like the Pilot! Joyce - I have the same van, Dodge Caravan, and I have regretting owning it every day. I leased this last time, because I wasn't sure how I felt about the mini-van and I got a great deal ($270 a month for a loaded van!) but it hasn't worked out, so I am glad I leased and can let it go. I agree, used is best and I did spy a used Pilot that looks like something I would love to check out. Erin - My husband is set on buying US, but I am the one to be spending the $, so ultimately it's my final choice. But, living here in Detroit these days... It's hard to justify NOT buying Big 3. Though that Honda Pilot is enticing! nfmgirl - I know, I know! It's hard to need a big car these days. Either your being scorned for driving a gas guzzler or you're paying dearly at the pump. It's a no win situation. Ruchi - I sounds like that Pilot is getting a lot of recommendations, I am now adding that one to my list. Secretly, my mother drives a Honda Civic Hybrid and my sister drives an Accord. They love them and they live in Detroit... So, I guess if you can't beat 'em! AnnMarie - My brother in law has the CRV and is really very happy too. It's too small for me, but it sounds like I have added it's big brother, the Pilot, to my short list of cars to look at!! I can highly recommend the Flex. I have one with my family of 4 and we love it. The styling is different from anything else on the road, the gas mileage is as good as or better than anything else with 7 seats and we have the optional DVD player, navigation and vista roof that the kids love. Overall, we are delighted with the Flex after 6 months and would recommend anyone to Drive One.